1 bedroom, 1 bathroom, living area and mechanical room, and loft with log stair case and 6’ porch. Log frame: Consisting of 3”x 6” tongue & grove logs (t&g) with saddle notch connections, ridge beam, loft joists with 2”x 6” t&g floor, log stair, timber truss with posts and jacks, inside walls in 3” x 6” logs and special log screws to secure logs. Roof system (recreational, without building permit): Consisting of 2”x 8” precut rafters, fascia boards, trim, sheet metal roofing, R-22 fiberglass insulation, 3/8” plywood for sealing, vapor barrier, tarpaper and miscellaneous screws and nails. Doors and windows (recreational, without building permit): Steel insulated man door for the entrance door, pine doors for the interior and vinyl sliding windows with mosquito screen. Doors and windows come with outside and inside trim and miscellaneous screws and nails. Wood floor: We provide the complete wood floor plan incl. detailed plans for the joist layout. Foundation: Pillars, sonar tubes, metal screws or a foundation with footings has to be installed by the customer according to our plans. Engineered plans are available for an extra fee. 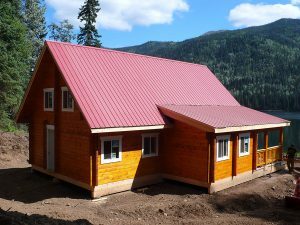 BC Log Cabins Inc. is a small business located in British Columbia, Canada. We manufacture different models of log cabins and work closely with our customers in designing a cabin according to their ideas and individual needs. These cabins are your home away from home. Perfect for recreational and lakefront properties, hunting cabins, fishing cabins and lakeside resorts.